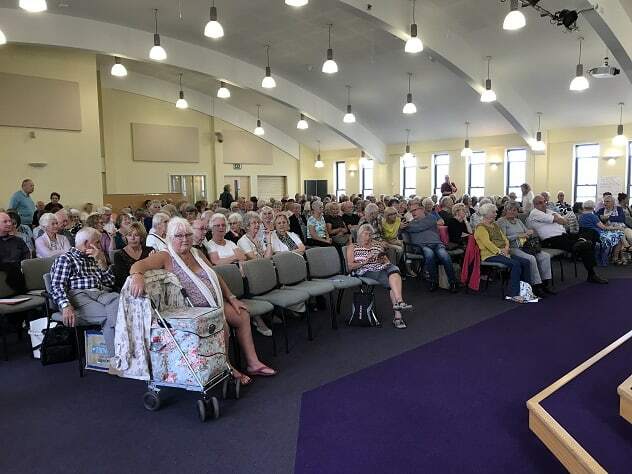 A public meeting in Broadstairs to discuss proposed cuts to subsidised bus services in Thanet and across the county was attended by some 400 people today (August 30). The gathering at GAP auditorium in Queen’s Road was about Kent County Council plans for three alternative plans for rural public transport in the face of impending cuts to subsidised services. The services are those that don’t have enough passengers to make a commercial return but are considered necessary for those living in rural areas. Kent County Council has been funding the services but says there is not enough money in its budget to continue doing so. KCC proposals were originally to cut £4 million funding for Socially Necessary Bus Services (SNBS). Some 78 SNBS contracts looked likely to be axed, including the 41-42a Monkton to Ramsgate service. But, as part of this financial year’s agreed budget KCC reduced that cut to £0.45 million. Earlier this year it was announced that consultation on funding cuts for Stagecoach services 39,42 and 56 in Thanet had been delayed. The majority of those at the meeting had come by bus according to a show of hands asked for by Cllr Jenny Matterface, one of the organisers of the meeting. 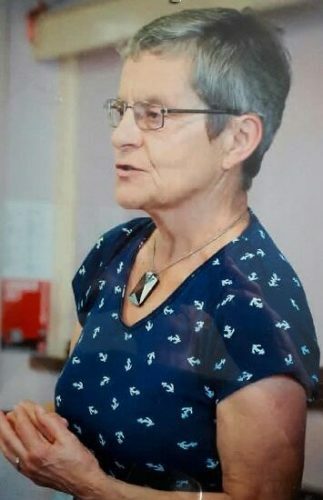 It was chaired by KCC councillor Rosalind Binks and organised by KCC councillor Barry Lewis, who paid for the venue hire with Jenny and two regular bus users. County councillor Mike Whiting, Cabinet Member for Transport, outlined the reasons why KCC is having to consider its funding for many services across the county. He emphasised that no decision had been taken about the three subsidised routes in Thanet that earlier in the year had been announced as under threat of being cut or rescheduled on an amended, commercial route. According to some in the meeting this isn’t what drivers are telling passengers. There were many question from the floor and Mr Whiting said he would take on board comments, although some of his replies didn’t placate those who wanted greater assurances about routes that are important to them. 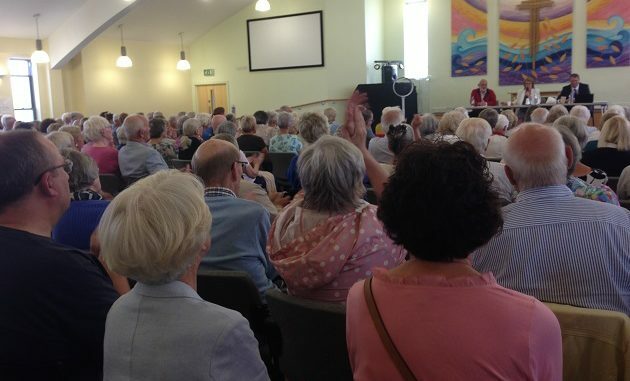 Cllr Matterface said: “I was pleased so many attended and even if they didn’t get the answers they wanted, they were assured no major cuts are planned. Craig Mackinlay MP also spoke about how important these meetings are and his disappointment that KCC isn’t giving more consideration to the use of community transport where available. “I was disappointed only KCC councillor Karen Constantine was able to attend although Lesley Game had sent apologies. Where were the other KCC councillors who should be fighting for their residents? During the meeting Cllr Whiting revealed £500,000 has been set aside to fund pilot schemes which will be carried out as a result of KCC’s Big Bus consultation. 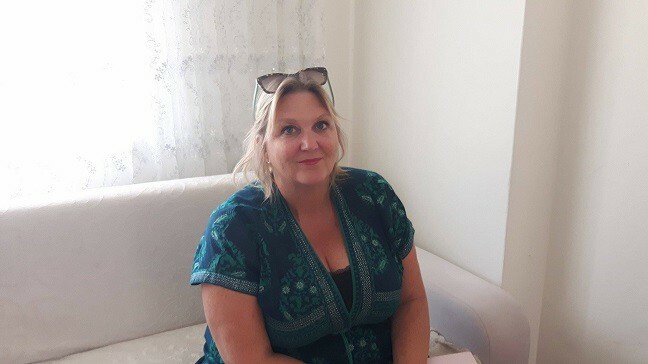 Cllr Constantine (pictured) said she has written to Cllr Whiting to request a specific consultation in Ramsgate. Karen’s photograph was taken before the meeting started. When it did there were people standing and even some out in the corridor such was the demand to hear and be heard. First Vale Square in Ramsgate, then Ramsgate harbour and now local bus routes. Hopefully this proves to Thanetians that people power CAN make a difference. Onwards and upwards. Mr. Whiting did talk about various options including a scheme similar to the hospital car one where people get a lift to the nearest bus route. No idea how that might be funded but something like the service that runs where a taxi-bus has a route and picks up passengers along the way. No idea how tha might work or if there would be an agreed fare structure. So our local M.P. thinks the 56 is ‘pretty safe’ Why do I not feel reassured?